Yup..It did happened after a lot of email exchanges and many phone calls. Thks to Dinesh for organizing it. We a group of 12 met at the place mentioned above (organized by Mr. Dinesh Chauhan). He took the responsibility in organizing the event and I along with Sudheendran & Alok reached there. The agenda of the meeting was Introduction, success story on Stammering by Tajeshwani (HR by profession) and next SHG meeting points. Sudhee being the oldest and also one of the experienced members spoke his heart out on the techniques he followed and told on some point of time each technique has helped him in some way or other. He told people stammer, “When they try not to stammer” i.e. When a person feels that he/she should not stammer at this word/situation, he/she is making himself/herself more conscious of the situation and the fear grips & hence the stammering. He also told why he stopped attending or conducting the SHG meetings. This followed by other member confession that “He tried to avoid responsibilities so that he can talk less. This resulted him not growing properly in his profession”. One of other member told that his boss used to stammer but now he talks smoothly. His boss asked him to go for regular Jogging and Meditation. Also, he is a tech lead in one of the IT Major but as per him; only few of his team members knows about the problem. He usually have problem while speaking over the phone. Then, a young engineering guy spoke how he got fed up in giving interview again & again. He shared how disheartened he has become on unable to clear the interviews of top notch companies. There was a rude remark given by one of the HR to him “If you are a stammer why you have done engineering”. (May not be exact words but kind of like that only). This has discouraged him more. His vision is to open his own business instead of giving interview. The intro was followed by success story by “Tejaswini”. She shared her story how “Brahmavidya” has helped her to overcome her problem. The video quality was not good and hence I cannot upload it. She is an Ex-stammerer. She was explaining us how she got over stammering. It was a very inspirational speech. She explained us how EFT and Brahmavidhya helped her from getting over stammering. She is still practicing Brahmavidhya and EFT on daily basis EVEN TODAY which is much appreciable. She has not left the habit of practicing which shows her commitment and sincerity towards her Goals. This was followed by Dinesh vision for SHG and thoughts. Check the pics below for few more information. 1. 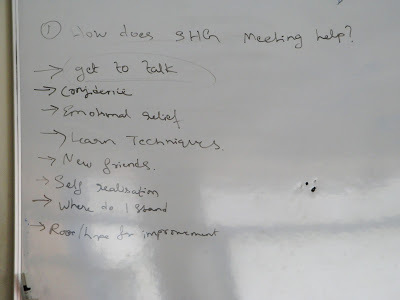 What benefits do we gain from SHG meetings? – Can be used as a stepping stone to graduate to Toast Masters..
2. 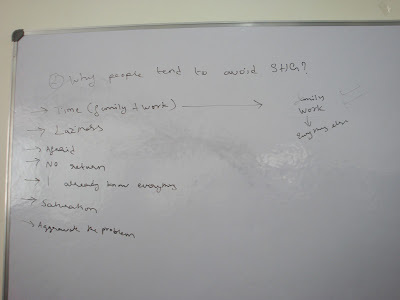 Why do we avoid SHG meetings? For the point 1, No time – Because of work and family : Here Dinesh explained us that each one’s priority is first Family and then work. All rest comes only next But here he beautifully explained how a good speech can enhance a person’s involvement in family and workplace multifolded. The growth for all areas in life is in effective Communication. For the next week, as an agenda, every person needs to come up with an icebreaker speech. Everyone was handed over a hard copy of what an icebreaker speech is and we concluded there. The event ended by 1PM sharp. The session was enriching and in some instances we laughed to the core. Overall, every person enjoyed the session and it was fun filled activity. Stammer ? Is it Really A Hindrance ……? Please advise my young friend..
Sign the petition for a better tomorrow..
Beautiful, a very well structured meeting! I hope Bangalore will continue with this enthusiasm and will be able to keep the meetings interesting the same way. Wow- a report from Banglore in a long long time, but very well written and presented. As they say, GOOD planning constitutes 90% of any "business". Karthik, I loved your song! Keep singing..Thnaks Dinesh, Tanoy, Sudhi- all of you! One of the best documentation yet! And above all- served fresh! Very prompt! Very well described by you all, with pics,videos and all others materials that helps to complete a well documentation. Really great bangalore PWS ans hats off to all of you. A woman atended is a good thing. I request the Bangalore SHG to keep this tempo and wish you all the best. Very encouraging. Good organisation skills to bring people together to talk about a concern that affects daily life. Once again Thks to Dinesh for showing the interest.